From Auburn Man to Monuments Man: AU grad Robert K. Posey inspired Bill Murray’s character in new WWII film. It’s like there’s an unwritten rule in Hollywood, of at least there should be: If you want to add realism to a World War II movie, work in an Auburn Man—not as an actor, as a character. Dean Hallmark, who came to Auburn on a football scholarship in the 1930s, and participated in the Doolittle Raid, was mentioned in Thirty Seconds Over Tokyo. Auburn resident George W. Greene was not only mentioned but actually appeared (as himself!) in the John Wayne classic Back To Bataan (which is one of the reasons the premiere has held in the Loveliest Village). And of course there’s the legendary Eugene Sledge, who came to Alabama Polytechnic in HBO’s The Pacific—and in real life—in order to finally learn how to do something other than killing the Japanese. But the most recent Auburn connection in a WWII film is arguably the most high-profile. Posey posing. He’s the most important looking one. You’re welcome, Art. That The Monuments Men movie that’s out now, that has George Clooney (he produced and directed it, too) and Matt Damon and Bill Murray and John Goodman and Cate Blanchett and the dude from Downton Abbey rescuing stolen works of art from the spiteful clutch of Hitler’s hordes? Well, it’s based on a true story, thanks in no small part to an Auburn Man. Murray plays Richard Campbell, whose monumental superpower is architecture. Campbell is technically a composite character, but he’s primarily (per the New York Times) based off of Jefferson County native Robert Kelley Posey, who graduated from Auburn with a B.S. 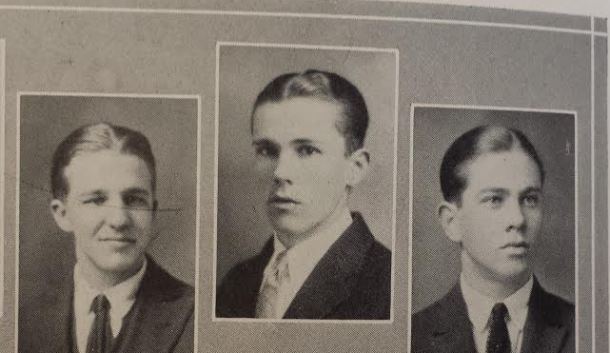 in Architectural Engineering in 1926, and a B.S. in Architecture in 1927. He even briefly taught at ol’ API. According to Auburn historian Ralph Draughon, Jr, Posey came to Auburn on an ROTC scholarship and was supposedly an activist of sorts, speaking out again Huey Long, the Ku Klux Klan, and fascism. Then he went and actually fought against fascism. He joined the Army Corps of Engineers in 1942, building airstrips in Canada. 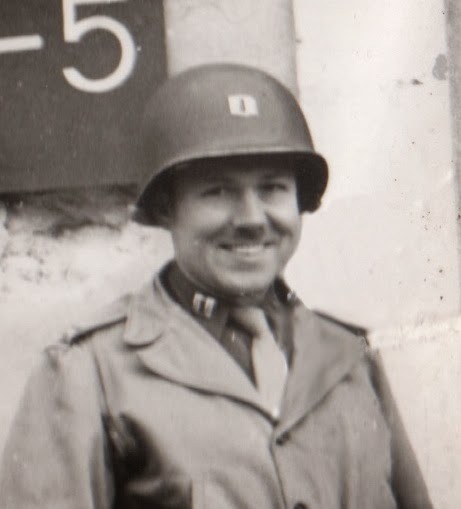 He quickly became Monuments Officer for Patton’s Third Army, which was kind of a big deal (so hey, maybe he’s the reason…). His assistant was a guy named Lincoln Kirstein, who in the film is played by the guy who played the head of NBC in Seinfeld, and who would later go on to found the New York City Ballet. They arrived in Normandy just after Shug and his Auburn Creed used the the power of Auburn football to survive D-Day. A smile no artist could draw. Posey’s first major discovery was in late February at the Priory Church of Mont Saint Martin in France, near the border of Luxembourg. As he entered the 11th century church, which had been locked since its roof was blown off during bombing in 1940, he discovered plaster walls peeling away from the rain. Under the layers of plaster was a rare wall painting of the Annunciation dating from 1350-1375, which had likely been hidden for centuries. Soon after, in Hungen, Germany, Posey and Kirstein discovered the eight buildings that comprised the Race Institute, used by Alfred Rosenberg to “research” the various people overrun by the Nazis. There they found rooms full of Torahs, anti-Semitic clippings, Jewish archives, and other confiscated materials. 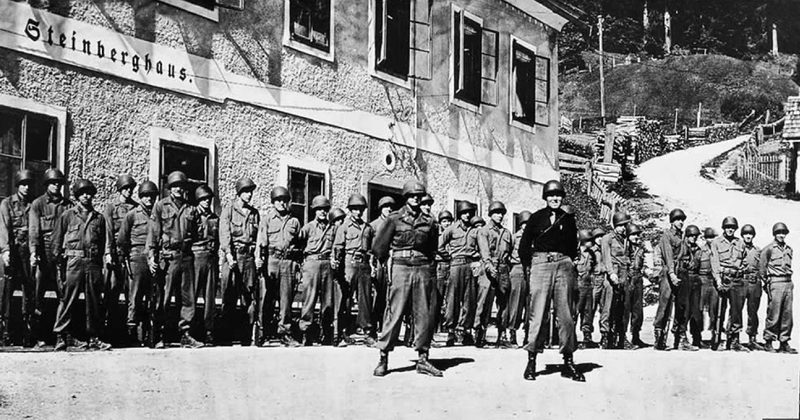 Perhaps Posey’s greatest accomplishment during his time as a Monuments Man was the discovery of the salt mine at Altaussee. Just days after the German surrender he found the Van Eyck brothers’ Ghent Altarpiece, Michelangelo’s Bruges Madonna, Vermeer’s The Astronomer, along with thousands of other works of art hidden in numerous chambers deep within the mine. 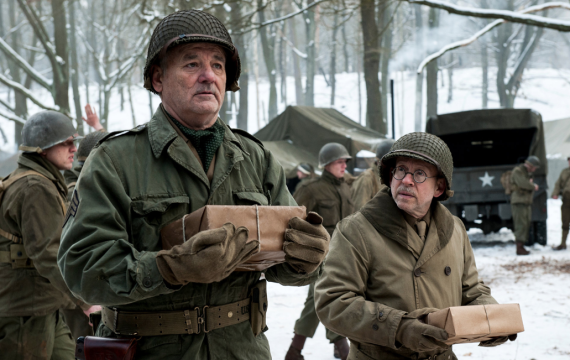 From what I can from the film’s preview and Google Image Search, that salt mine that Posey found was probably the Monuments Men’s most dramatic discovery, at least in terms of what makes for good photos and scene settings. 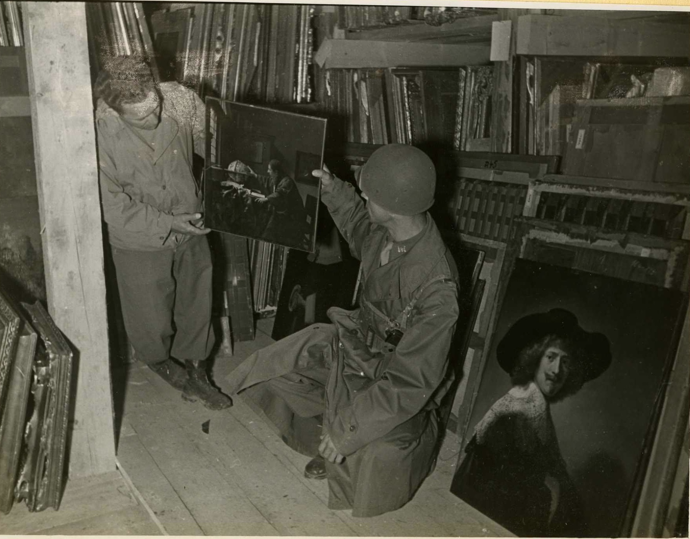 Posey (left) examining the unspoiled of war, one of literally thousands of paintings he helped recover from the Nazis. After saving Europe from artless existence—and his Legion of Honor award from France and Order of Leopold commendation from Belgium suggests they sure did appreciate it—Posey has a distinguished career with Owings, Skidmore, and Merrill, an internationally famous architectural firm. He died in 1977 and is buried in Elmwood Cemetery in Birmingham. h/t William Freeman, Ralph Draughon Jr. 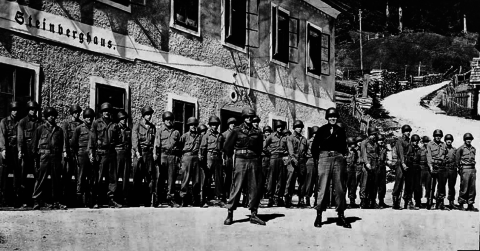 Photos: Monuments Men Foundation.